The earliest recognizable printed map of Bombay, India. A New Mapp of the Island of Bombay and Sallset. An extremely scarce map, this is John Thornton's 1711 map of Bombay Harbor, India. 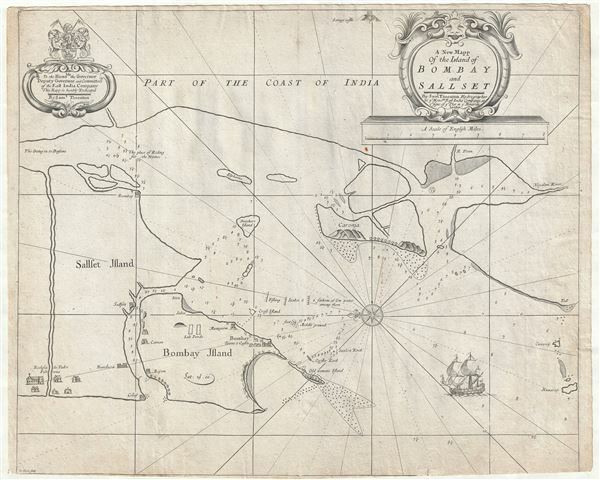 First drawn in 1685 for the Atlas Maritimus, this map is the first printed map to offer any real detail of Bombay harbor. Following in the style of the Thames School, this map covers all of Sallset Island, Bombay Island, and the nearby coast of India and a few other surrounding islands. It offers numerous depth soundings and identifies the Jesuit Mission of Poloremo, a winter anchorage in the Bassein Estuary, and various fortifications. The chart is dedicated in the upper left quadrant to the governors of the British East India Company, of which Thornton was the official Hydrographer. This map exists in three known states, all of which are cartographically identical. The first state features John Thornton's imprint under the dedication and is dated 1685. The second state bears no imprint under the dedication and dates to 1702. In the third state, this example, 1711, the dedication returns, this time to Samuel Thornton, John Thornton's son and heir. The present example also bears a pastedown in the title cartouche advertising the establishment of James Atkinson at Cherry Garden Staires, Rotherith (Rotherhithe). Atkinson maintained a bookshop in southeast London. He also taught mathematics, but little else is known of his life. John Thornton (October 8, 1641 - January 23, 1708) was a British chartmaker, sea captain, publisher and engraver active in London during the late 18th and early 19th centuries. Thornton apprenticed to John Burston where mastered the art of manuscript maritime cartography as practiced by the Thames School. By the 1660s Thornton, working with John Seller and William Fisher, began publishing printed nautical charts and was the only Thames School cartographers to successfully transition to print. Thornton published numerous maps both independently and with some of the most prominent British publishers of his day, including the aforementioned as well as Herman Moll, Robert Morden, James Clark, Robert Greene, and Philip Lea. From around 1665 Thornton took over from Seller the production of the English Pilot. Upon his death in 1708 Thornton willed his charts, copper plates, instruments, and 'all things belonging to my calling' to his son, Samuel Thornton, who continued to republished his father's work, with few updates, until about 1715. Thornton, J., The English Pilot, Third Book (London), 1711. Very good. Lower margin narrow. Some toning and water stains to lower left and righ quadrants. New York Public Library, Map Div. 02-295. Coolie Verner and R. A. Skelton, John Thornton, The English Pilot, The Third Book, facsimilie edition. Phillips (Atlases), Vol, 4, pages 138 - 39 identifies this map as being issued in the 1711 edition of the English Pilot, 3 rd book, Plate 21.